Love Injection: Conversations is the sonic extension of the print fanzine out of New York. Paul Raffaele & Barbie Bertisch host roundtable discussions, interviews and invite friends to discuss music and the culture surrounding it. It’s pre-recorded at Red Bull Studios in New York and aired the third Saturday of the month from 10am-12pm PST (1pm-3pm EST) on Dublab. These are the resulting recordings. Two hours of conversation with Justin Strauss, one of NYC’s most important DJs and producers. From his teenage years at Milk n Cookies to DJing the city’s best to a massive list of remixing and original productions that speaks volumes, it’s hard to keep conversation to a 2-hour limit. He’s an influence to many and a dear friend who continues to inspire us through words and music. Listen. Two hours of music and conversation with Bruce Forest, resident DJ of Better Days. For those who loved the long-form piece in Love Injection Zine #15, this could be considered part deux. Listen. Two hours of conversation with Tim Lawrence, currently touring his new book, Life and Death on The New York Dancefloor: 1980-1983 (Duke University Press). Tim is a professor and researcher at University of East London, and esteemed writer who found himself documenting underground dance culture in NYC. He is also co-founder of Lucky Cloud. Listen. We sit down and spend two hours of music and conversation with Tom Noble of Superior Elevation Records, where we chat record dealing, his work as House of Spirits, and rarities on wax. Listen. Two hours of music and conversation with Douglas Sherman, musical host at NYC’s Joy party and today’s incarnation of The Loft, the gathering that David Mancuso started back in February of 1970. In hour 1, you’ll hear the records Doug inspired and excited him growing up. In hour 2 we get into the records that meant the most to him in the context of The Loft... Listen. 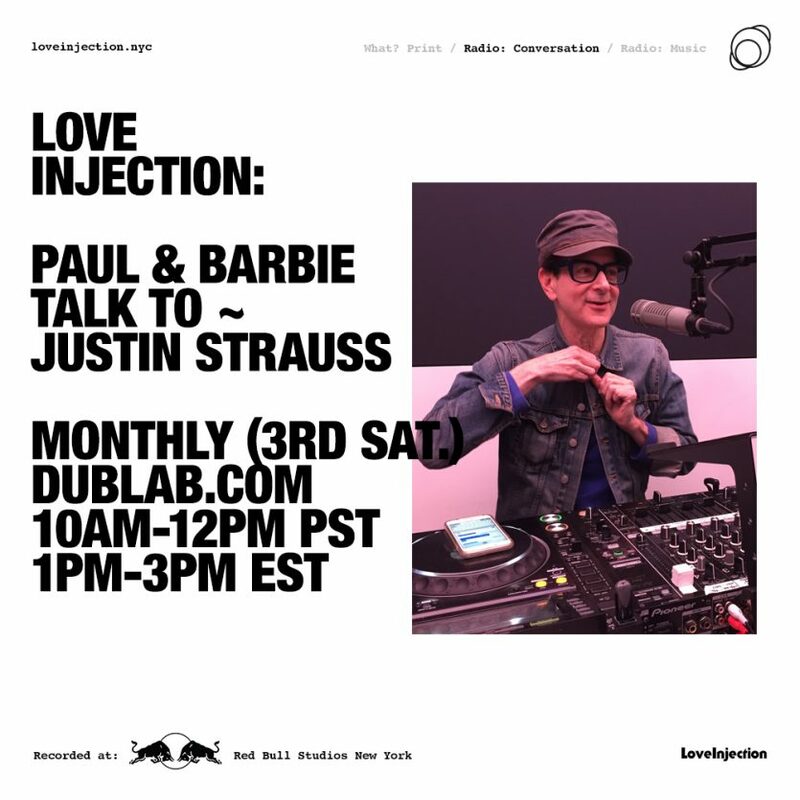 Paul & Barbie introduce Love Injection Conversations and get a surprise visit from Alex From Tokyo upon the release of his new album Tokyo Black Star, “1999” on World Famous Records. Listen.